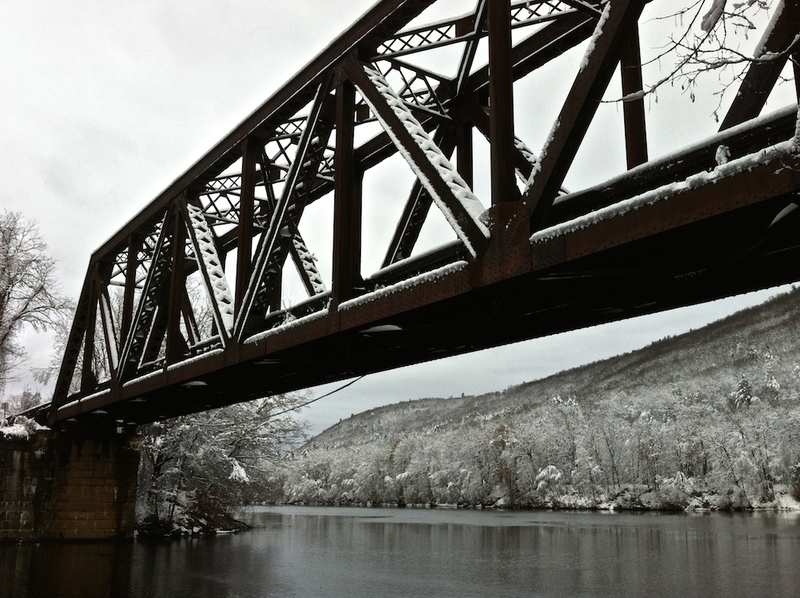 Part of the Connecticut River Line, the New England Central spans the mouth of the West River in Brattleboro, VT as it heads northward to White River Junction. 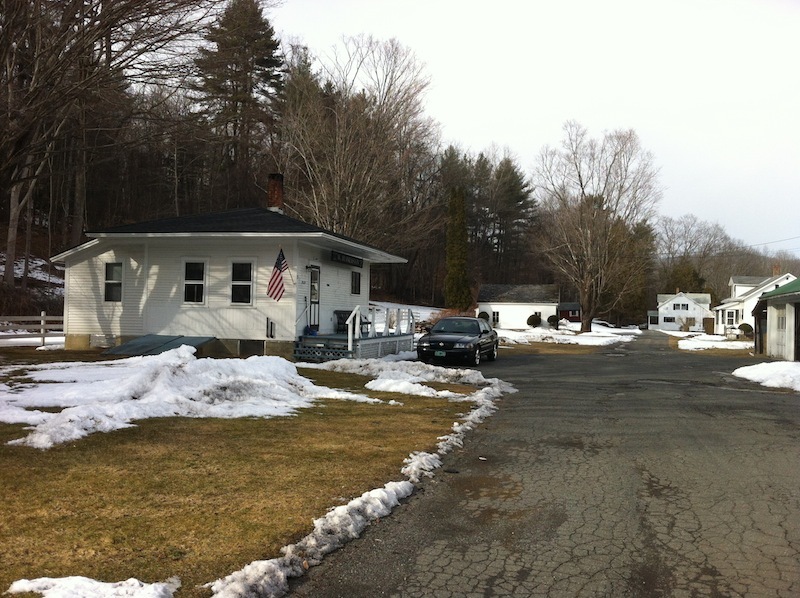 Neighboring New Hampshire accompanies its progress on the eastern side of the broad divide. The bridge is a Warren through truss with verticals, built in 1930 by the Phoenix Bridge Company and is the most recent version of several at this location. 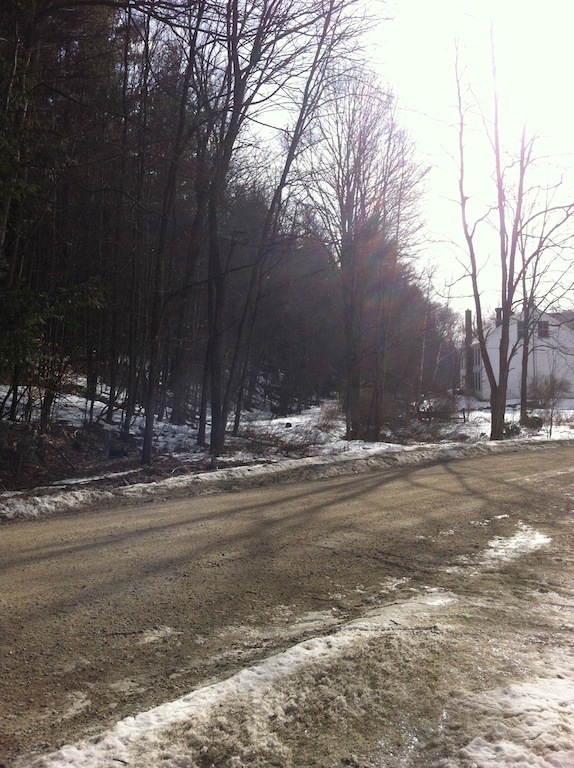 The first railroad to utilize this waterline right-of-way was the Vermont Valley in 1850. In which Part Seven is more accurately entitled Part Five Continued. 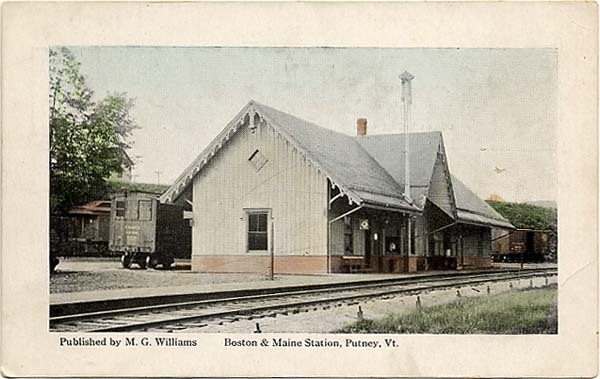 It’s a return to the Putney station on the Vermont Valley Railroad, part of the Connecticut River Line (later the Rutland Railroad, Boston and Maine, Vermont Central, et al. ), with some light to shed on the evolution of the depot building itself and a few asides. Sometimes things take a turn, and the old aphorism “You don’t know what you don’t know” takes on fresh meaning. However, the more light shed, the more clarity and who doesn’t like credence? 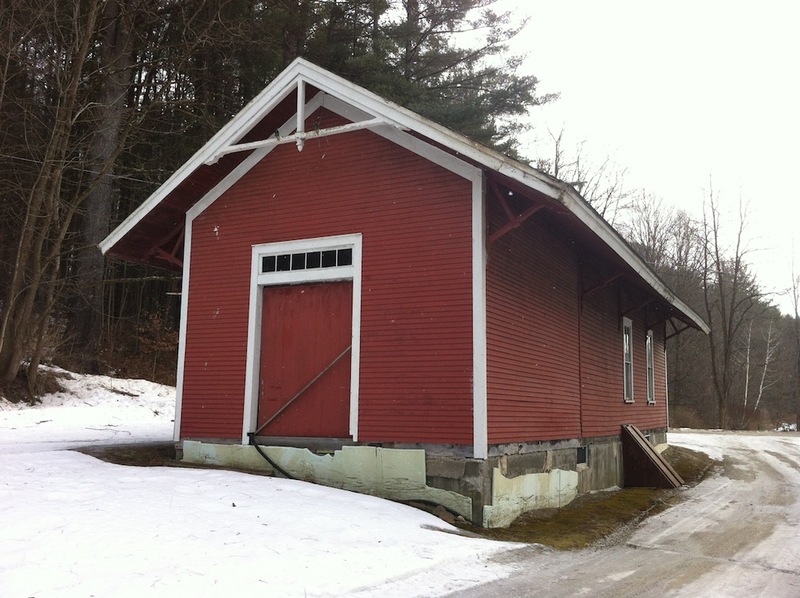 The original depot building built by The Vermont Valley Railroad described in my earlier post, a Victorian structure in keeping with the times and other sister stops on the same line. Note the wooden rolling stock on the back track, including a passenger coach, and the single mainline track in this vintage postcard from the Middlebury Collection. The Vermont Valley Railroad came north from Brattleboro, Vermont starting in 1850, up the west bank of the Connecticut River to Bellows Falls, Vermont, a major rail interchange in those burgeoning days. There it connected with the Cheshire Railroad, the first to service Bellows Falls in 1849 (just across the river in North Walpole, New Hampshire); the Sullivan (later Sullivan County) Railroad, also of New Hampshire, which reached North Walpole from the north later that same year; and the Champlain and Connecticut Railroad (later the Rutland and Burlington RR) which linked Bellows Falls and Burlington at the very end of the year 1849. The Vermont Valley Railroad opened for service in 1851, making the Bellows Falls connection through a novel 400-foot-long tunnel dug under the village’s business district so that it could make the approach to the junction on the “Island.” The 30 acre “Island” was created when the Bellows Falls Canal, the first in the nation, opened to allow navigation around the Great Falls in 1802. 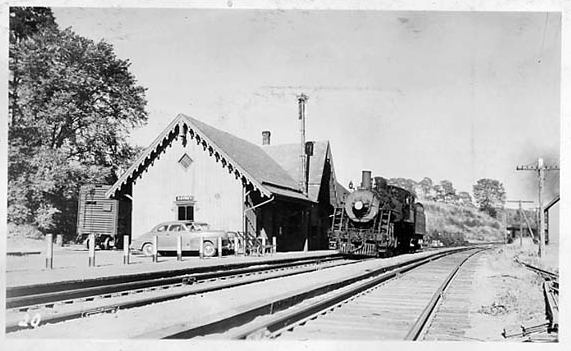 A 1940’s (or later) photograph with a southbound loco shows the original station but now fronted with double track; the second main track between Putney and Bellows Falls, Vermont, about 14 miles, was constructed between 1901 and 1903. Steel rolling stock waits on the home track and a post barrier of short rail sections has been installed at the edge of the parking area. The railroad built its depots, as most lines did, in an architectural style reflective of the time period and scaled to the settlement it was serving (as well as the construction budget!). Putney’s wood-frame Victorian station was quite similar in looks to others up and down the road’s rails, with a steep cross-gabled roof, gingerbread rake trim, diamond windows, pendants, hooded window casings, and a bay window trackside to allow the stationmaster a good view of the trackage. Another shot seemingly taken on the same day; the Putney Station placard is hung over the gable window’s hooded head casing. The lower quadrant style semaphore‘s arm is in the down (or off) position, signaling the track is clear to proceed. 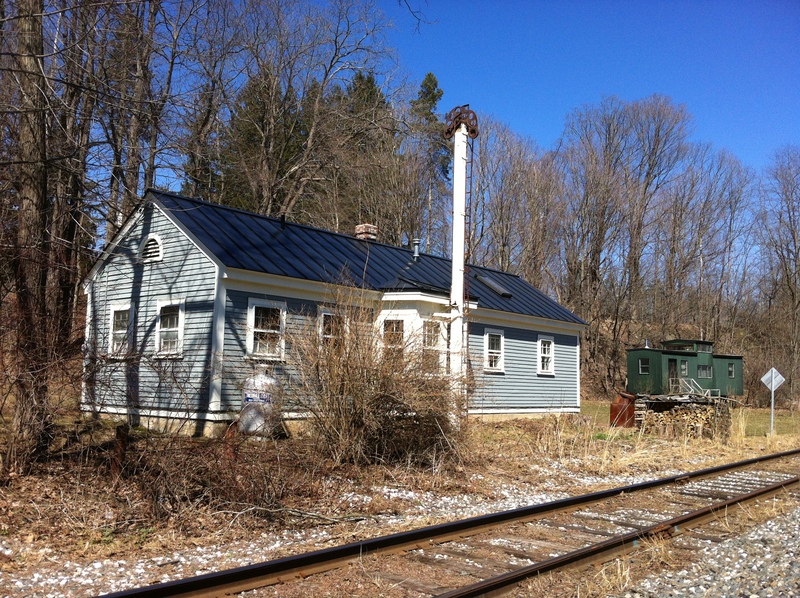 Through further research, this author has learned that the Putney Depot in its original incarnation met its end in a night fire on April 13, 1951 and was replaced with a new, smaller structure the following year. Operation at this time, very near to the end of service to the small town of Putney, was by the Boston and Maine. The new station building was built on roughly the same footprint, if not the same foundation, as the original; the bay window location is relatively unchanged, but the structure’s length appears shortened. The semaphore signal is now an upper quadrant type, a common-sense safety improvement over the older lower quadrant model: if the operational wire or throw rod was broken, the arm would fall by gravity to the horizontal (blocked or danger) position, whereas the old style’s arm would fall to the vertically down (off or safe position) – a potential hazard if the track was not, in fact, clear. The rebuilt Putney Depot stood on the same footprint as its predecessor and is the structure still standing in that location. A boxcar lurks in the shadows as before. The purpose of the stone curbing between the double track, also seen in the earlier photographs, is puzzling. As per my earlier post on the subject, the Putney station building is the one still standing in that location, near Kathan’s Ferry crossing on Depot Road; it’s available as an overnight rental through AirBnB. Permanently parked on a remnant of back track behind the depot is a wooden car with a cupola, but this is not a caboose. It is an ex-Central Vermont flanger car, used to scrape the rail top surfaces after the plow had cleared the bulk of a snowfall from the right-of-way; the cupola gave the operator a view of the tracks so the blades could be lifted at switches and grade crossings for clearance. Formerly Central Vermont Railway rolling stock, it was last in the possession of Green Mountain Railroad; saved by the owner from the scrapheap, it was moved to its present place of repose around 2002. A flanger car on the Genesee and Wyoming Railroad in Retsof, NY (image by John LaRue). 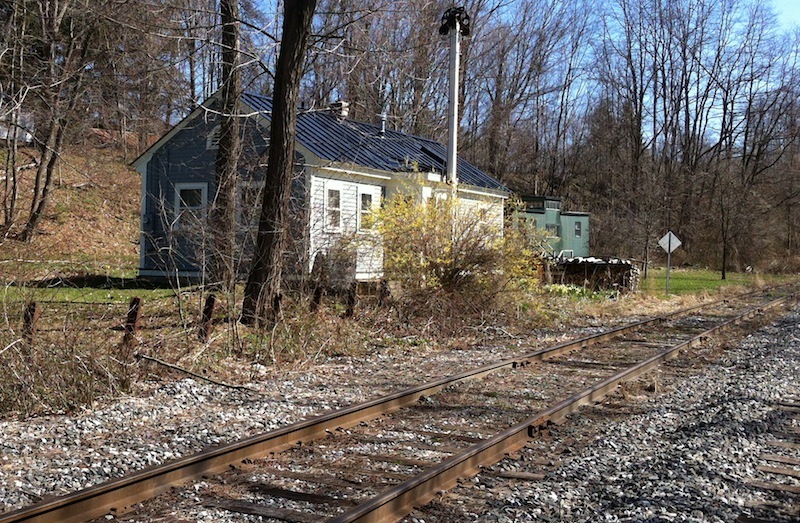 In a strange twist of coincidence, the trackage in front of the Putney depot is now operated by the G & W, which took over RailAmerica’s New England Central Railroad, the most recent owner of Vermont Valley’s original Connecticut River Line, in 2012. There’s no end to the pleasant discoveries that may be made as we poke around the brambles, the library stacks, and the web. Thanks for dropping in – please feel free to leave a comment if you like and be sure to check back for more ad hoc adventures and depot discoveries! 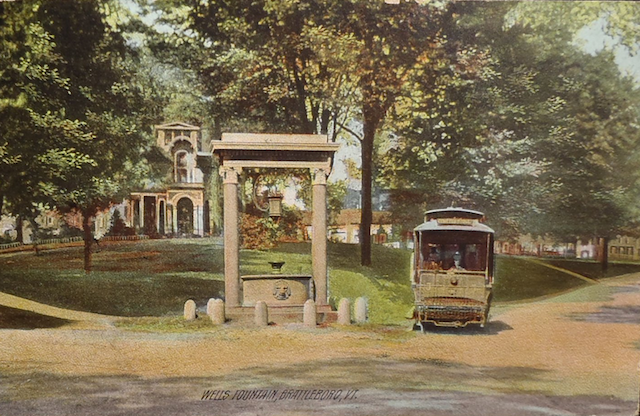 A vintage postcard shows the trolley passing the Wells Fountain at the north end of its route, after having looped past the Common. Vermont’s Windham County Superior Courthouse now stands behind the fountain, replacing the Victorian residence. 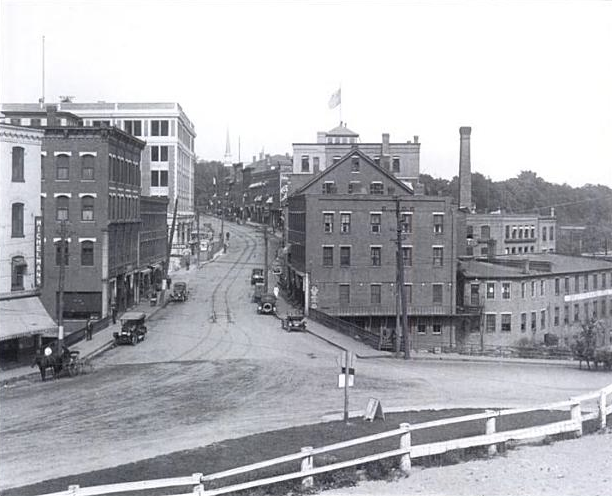 The Brattleboro Street Railway Company ran its first public trip on August 1, 1895. 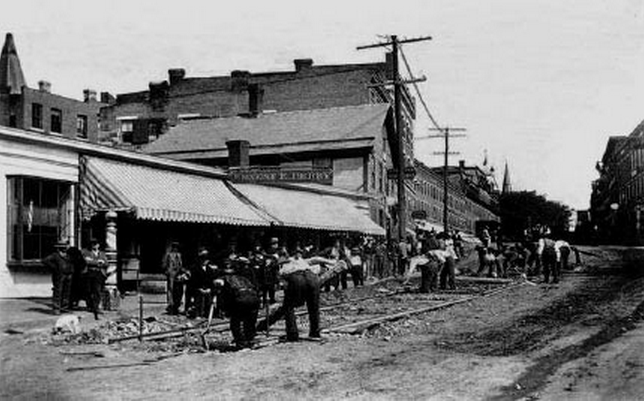 This photo shows the rails being laid on lower Main Street, approaching Whetstone Brook. Brattleboro’s lower Main Street some years later, showing the trolley tracks with one of the three turnouts on the line: this one to transfer passengers to Union Station, to the right of the frame at Bridge and Vernon Streets, for the Central Vermont and Boston and Maine. I have a favorite morning spot on the backside (and trackside) of the Brattleboro’s wonderfully active brick-fronted Main Street. The east side of the downtown commercial area edges up to the Connecticut River and is shadowed by New Hampshire’s Mount Wantastiquet on the far bank; the mainline tracks of the New England Central lie below a steep embankment, following the watercourse and parallel to the downtown structures. There are a couple of alleys that penetrate the three- and four-story blocks and allow a quieter, albeit less polished, view of the river valley, away from the bustle of streetside facades and traffic. 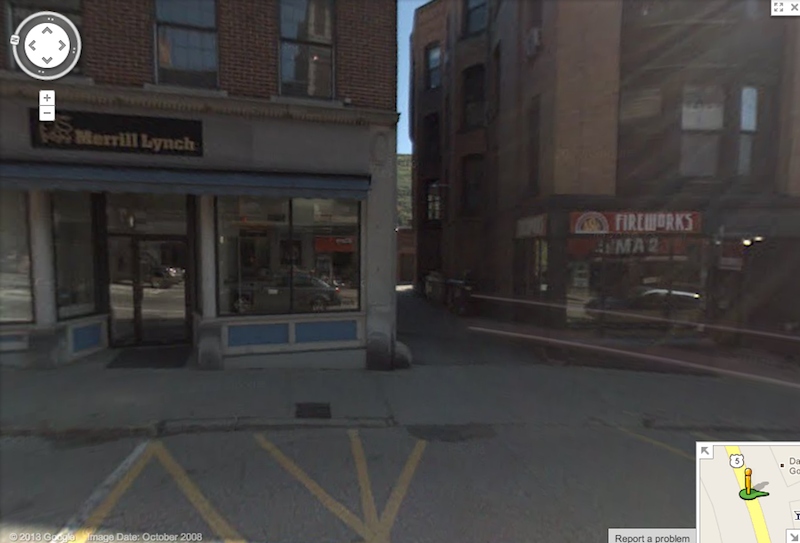 The vantage point under discussion is behind the Richardson (1924) and Devens (c. 1840-45) blocks: there, a stout railing tops a retaining wall for private parking and access to the humbler back doors of the commercial buildings. In this case, the railing is truly a railing. Google Streetview shot of the alley; in one of those strangely serendipitous digital anomalies, the ghost of trolley tracks leads into the narrow side street. The sturdy construction befits its precipitous perch; steel posts edge the paved terrace behind the buildings and broad planks span them, keeping everything from tumbling down on to the tracks: pedestrians, parked cars, dumpsters, backfill. I had noticed a long time ago that the posts were actually lengths of used rail; I didn’t think about it much at the time, since finding repurposed rail in a trackside situation is a rather common occurrence. 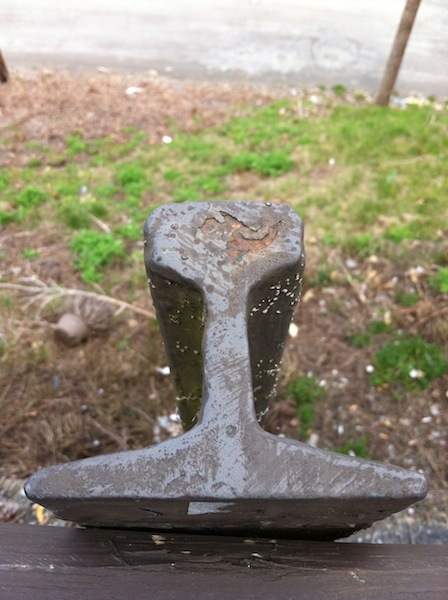 Then my value perception shifted: I learned about mill marks on steel rail and realized there was some useful information to be gleaned from this bit of long-lasting industrial evidence. Perhaps if I went back and looked closely, I might find a clue as to their origin, now that I had an idea about where to search and what it might connote. The railing in situ, trackside on the NECRR mainline, but… we cannot asume the salvaged steel is related to the nearby track simply by proximity. Most modern North American trains roll on T-rail, so-called from the profile of the rail in cross-section. 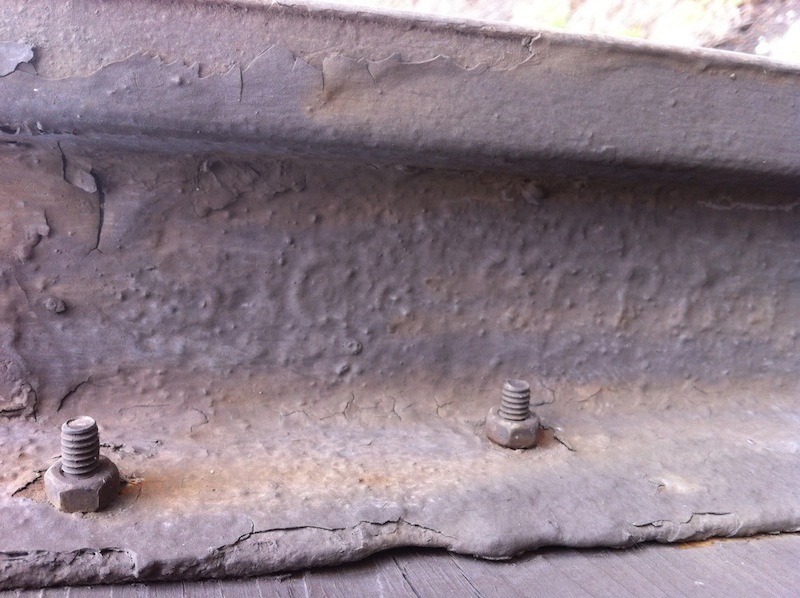 When T-rail is rolled at a steel mill, it is labelled permanently on the web of the rail, which is the thin section between the top – the “head’ – and bottom – the “base” or “foot”) with several bits of information, historically with raised characters in relief and more recently with a stamped legend. 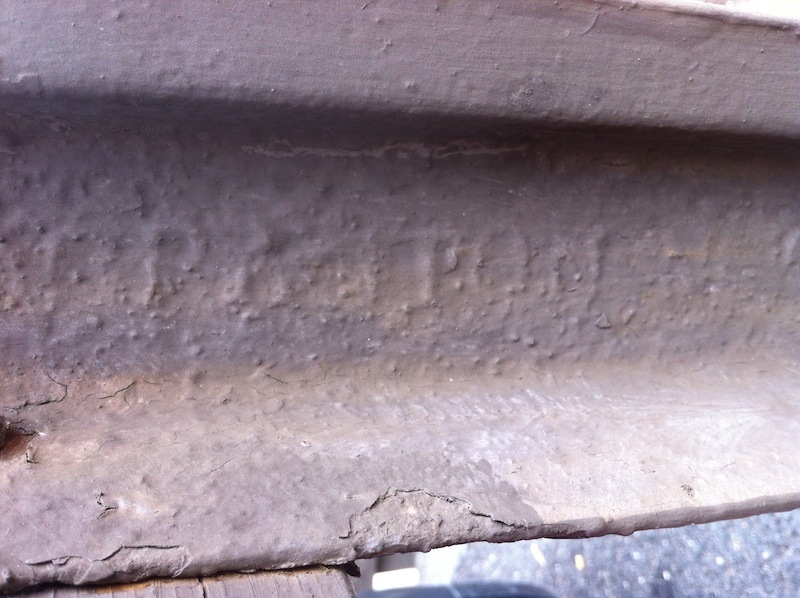 Usually these “mill marks” include the company’s name, mill location, date of manufacture, and the size of the rail, among other data possibilities. Rail comes in a plethora of sizes, most of them standardized by the industry’s overseeing organizations, so that sundry track installations can match each other cleanly as far as height and width, etc. Size is referred to in terms of weight per linear length – in the case of North America, in pounds per yard. 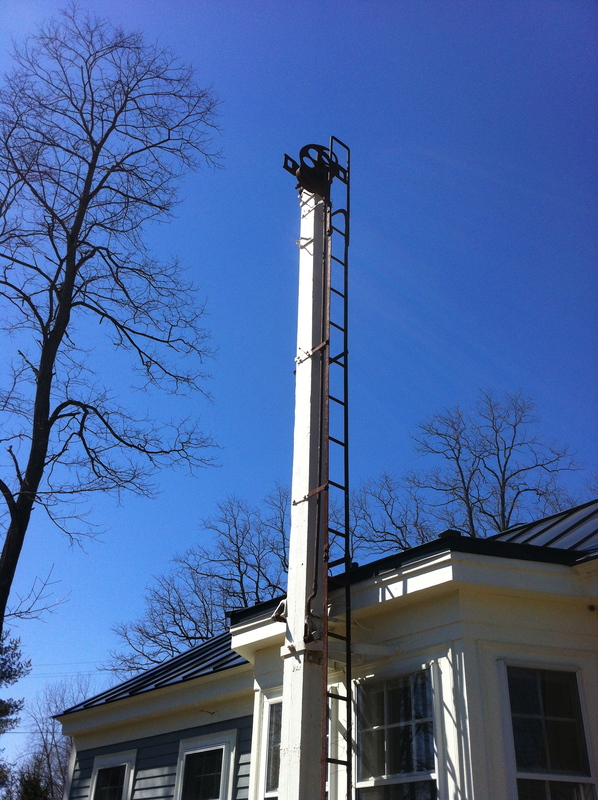 Older installations tended to be lighter weight, since equipment was smaller and performance was less demanding; rail is sized by expectation, in other words, as well as the technology of the time. Mainlines are heavier; sidings are downsized. 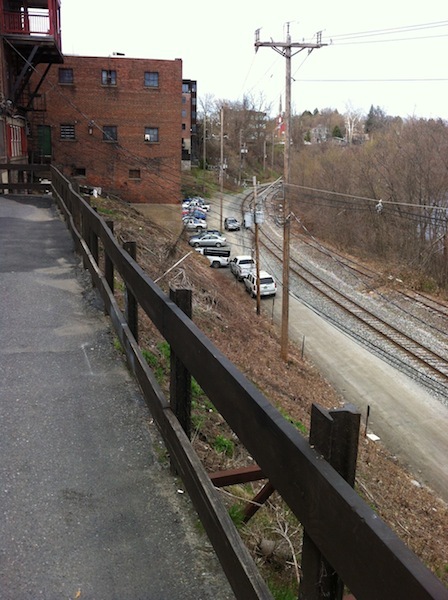 The Brattleboro Street Railway, to give an example, might be expected to have laid a rather light rail specification of, say, 50 lbs., due both to its era and its primary deployment of single streetcars. Today’s mainlines are much heavier: the New England Central Railroad mainline through Brattleboro, for instance, is continuously welded steel rail with a weight of 112 lbs/yard – and that’s not as heavy as other, much more heavily freighted lines. 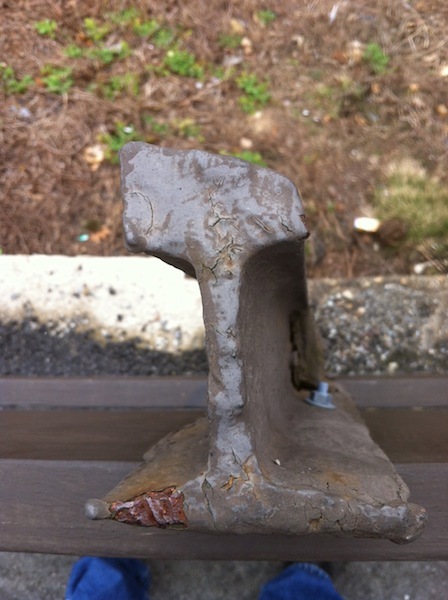 A cross-section of lightly-worn used rail allows measurements of the critical dimensions. There are a couple different rail sizes incorporated into the railing in question, but most of them are the lightweight examples which had struck me as unusually small. A fact to keep in mind when measuring used rail is that the surfaces are worn, sometimes heavily, especially on the faces in contact with the rolling stock’s wheels, usually the top and one side of the head; curves will be worn even more heavily on the outer rail in the radius. Thus, it’s important to look for the least worn specimen at hand. Armed with a tape measure, I recorded the a few of the various dimensions needed to identify the rail size: width of head 1.75″, width of base 3.75″ , thickness of web .5″ , total height of rail (base to head) 3.25″ . Vintage rail tended to have a 1:1 ratio between total rail height and width of base, in other words, they should match. In this case, it was slightly off but this can be accounted for by several factors: wear, mill variation, or a non-standard specification. I consulted a rail size chart and could not find a perfect match; I narrowed the specification down to the 35-45 lb. class. 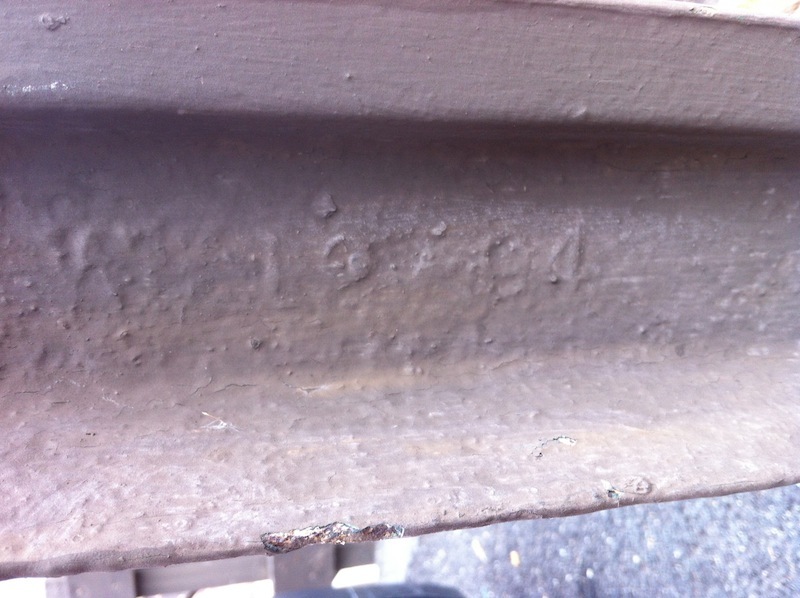 A heavily worn rail cross-section, probably from the outside member on a curved section. What this tells us is that this section of 35-45 lb. rail was most likely rolled in Scranton, PA by LI & S Co. in December (12) of 1894 (94). As a point of reference, when new trackage is laid the rails are usually taken directly from the gondola or flatcar on which they were shipped by the mill. Orders are filled as they are placed; newly laid rail may be only weeks old – generally, rail is not stockpiled but sent out as soon as it is rolled. Now, combine that with the fact that the Brattleboro Street Railway was laid in 1894-95 – officially opened in August, 1895 – and we have an interesting proposition before us. There is a pretty good chance that these recycled railing posts are one of the few vestiges of the Brattleboro trolley extant. I have not yet been able to confirm from which company the original rails were procured just before the turn of the century; this would be an excellent clarification. The only booklet on the subject, Trolley Days in Brattleboro, by Donald Shaw (1948) has very little hard and fast information – it’s mostly assembled anecdotes from the town’s Vermont Phoenix newspaper articles of the time. I’ll keep digging… In the meantime, I have a couple other leads to pursue on the former trail of the Brattleboro Street Railway Company. Have your tickets ready, please! The traditional crossing sign still stands, on a post made from a length of rail. A brand new crossing control system (#129.95) has been installed nearby as part of the high-speed rail improvements made recently on the Connecticut River Line. 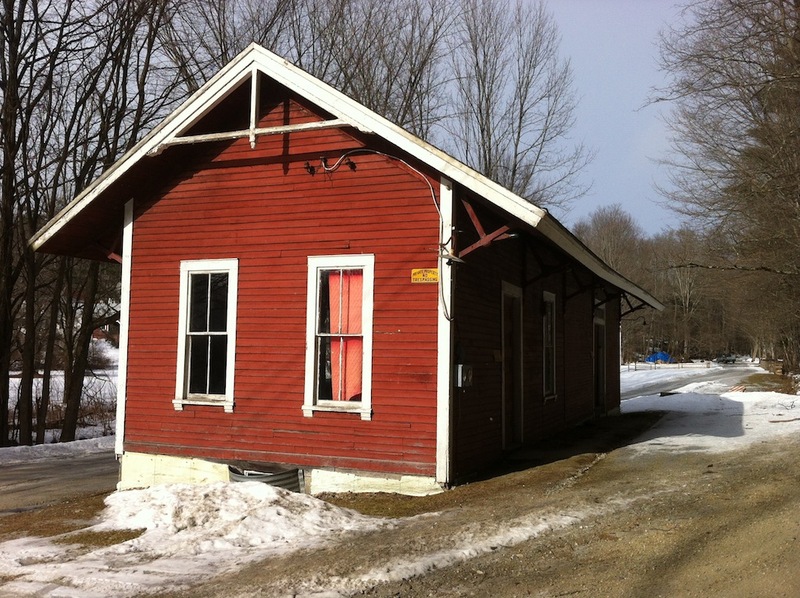 My latest adventure took me to Putney, Vermont, just north of Dummerston Depot and a few miles north of Brattleboro on the one-time Vermont Valley Railroad, now running under the colors of the New England Central. In the intervening years between its opening in 1851 and the present-day, of course, many other insignia travelled along this winding but mostly gentle grade which follows the Connecticut River valley and the watery boundary between the states of Vermont and New Hampshire. 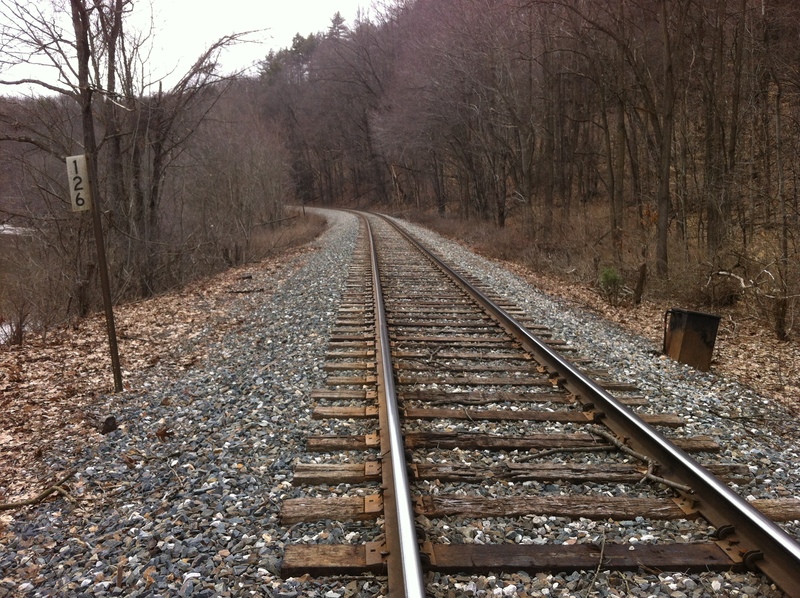 The Rutland Railroad, the Boston and Maine, Central Vermont, Guilford… these are a few of the companies which have used this section of trackage along the Connecticut River Line. Soon there may be a fresh, bright livery coming up the tracks in the form of orange with an accenting yellow base and black trim: Genesee and Wyoming was just approved (December 2012) to take over RailAmerica, parent company of the New England Central. 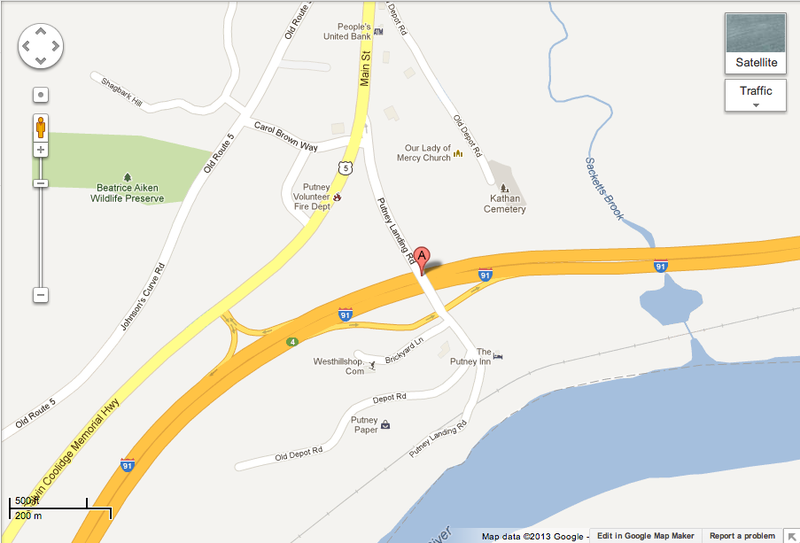 Screenshot from Google Maps shows how Old Depot Road was bisected by the building of Interstate 91. The riverside end is accessed from Putney Landing Road now. Putney is a small southern Vermont village in the town of the same name (total U.S. census population of 2,634 in 2000; now estimated at 2,702), once known mostly for agriculture and water-powered manufacturing mills. It was chartered in 1753; although settlement began shortly before that time, the long French and Indian Wars were going on and this was contested territory. Settlement did not begin in earnest until the British defeated the French (alongside their respective Native allies) at Quebec in 1760. The small town grew rapidly and began producing products that needed a way to be brought to market, along with a population that desired a means of transportation faster and more reliable than a horse on a rutted or snowbound dirt road. The Vermont Valley Railroad Company was incorporated in 1848 (amended 1849) with plans to build from Brattleboro, Vermont to Bellows Falls, Vermont directly north up the Connecticut River Valley, a distance of approximately 24 miles. 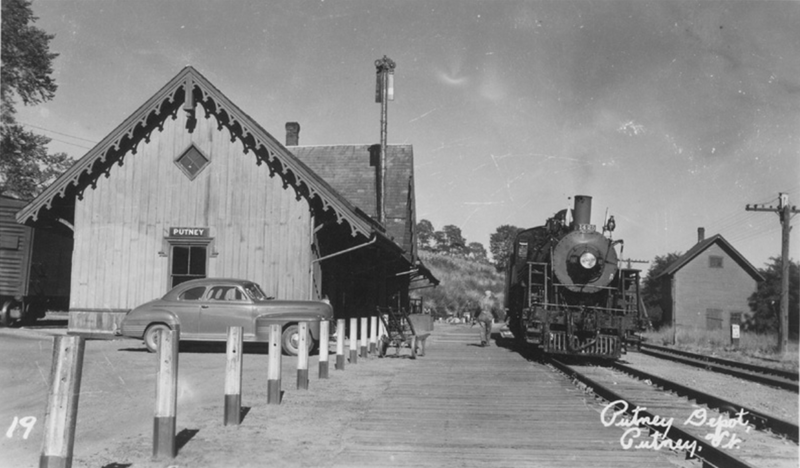 Construction began in 1850 and the trains began running in 1851; the Putney Depot was a regular stop. Another stop was made in East Putney immediately north, another tiny mill settlement at Putney Falls (but that’s another story!). A vintage postcard from the Middlebury College Archives shows the original Victorian trim and an assortment of rolling stock on the back siding (view looking northwest). Putney Station is just off of the eastern section of Old Depot Road, a town highway now split into two separate lengths by the construction of Interstate 91 a few decades ago. 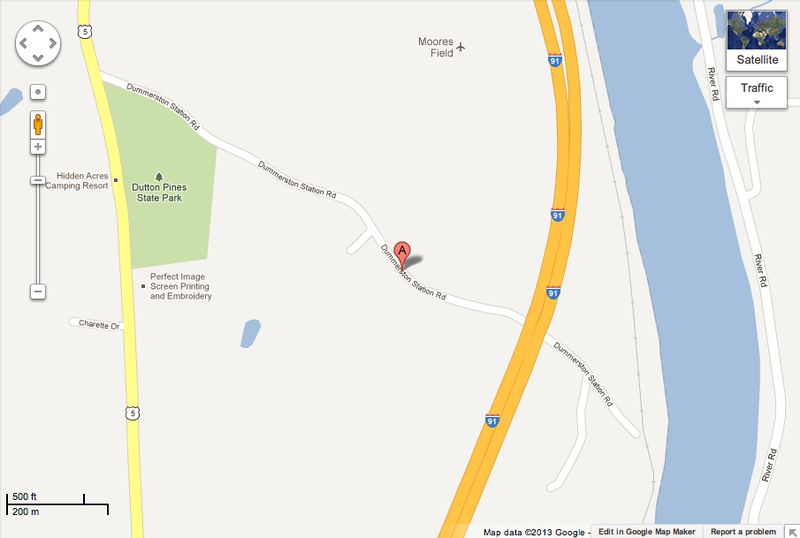 It is accessed by turning east from Vermont Route 5 at Curtis’ World Famous BBQ on to Putney Landing Road, which also functions as the feeder from I91 northbound. The station building is left (north) of the railroad crossing (NECRR mile marker 129.95), across from the Putney Paper plant (dba as Soundview Paper Company these days) and immediately before the road crosses the tracks (the west side) and drops to the river at the Putney Landing. The historic landing (actually the southernmost of two main crossings) was begun by Captain John Kathan in 1752 to connect the town with Westmoreland, NH: it’s now an official Vermont Department of Fish and Wildlife Access Area, #170, a beautifully peaceful spot on a wide stretch of quiet river. A southbound New England Central freight heads over the Putney Landing crossing (052748C in the Federal Railroad Administration’s crossing databank). 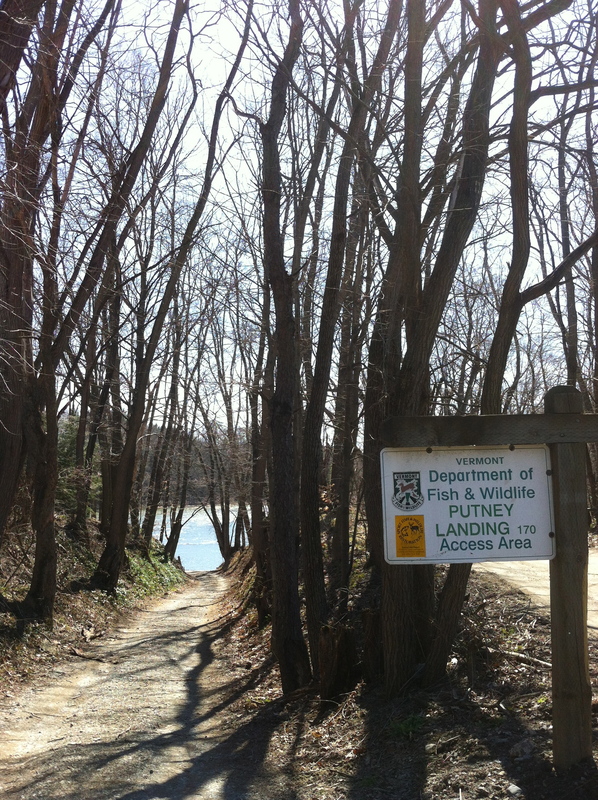 Putney Landing Road drops to the former Kathan ferry crossing (circa 1752) to New Hampshire on the Connecticut River, now a state recreational access point. The railroad depot structure has seen some changes since its glory days on the Vermont Valley and Boston & Maine Railroads, but it is in fine repair and if you’re a railfan, it’s even available for an overnight stay from the current owners, through AirBnB. Now, that’s a rare treat! About seven trains a day (including Amtrak’s Vermonter on its roundtrip to St. Albans) pass through this now-sleepy intersection, horns blowing but no whistle-stop to be had. The depot building as it stands today, rebuilt with substantial facade changes but maintaining the same asymmetrical layout; . There’s even a caboose (nearly all of its superstructure has been replaced) on the remnants of the back siding. True to the period in which it was built, the original building was Victorian in style. More ornate than some others in the area (see my posts on the West River Railroad), the steep cross-gabled roof with its gingerbread trim, diamond window, hooded casings, rake pendants, board-and-batten siding, and bay window are reminiscent of the next Vermont Valley Railroad station south, in East Dummerston. The bay window has survived, along with the semaphore signal tower – lacking its wooden arms now – but still standing tall. Looking south past the station, Putney Paper’s processing mill stretches along the trackage, its siding now gone. The block’s signals glows red from the recent freight. The upper quadrant semaphore signal sleeps in its horizontal (danger or blocked) position, painted arms and colored glass light lenses missing from their sockets. 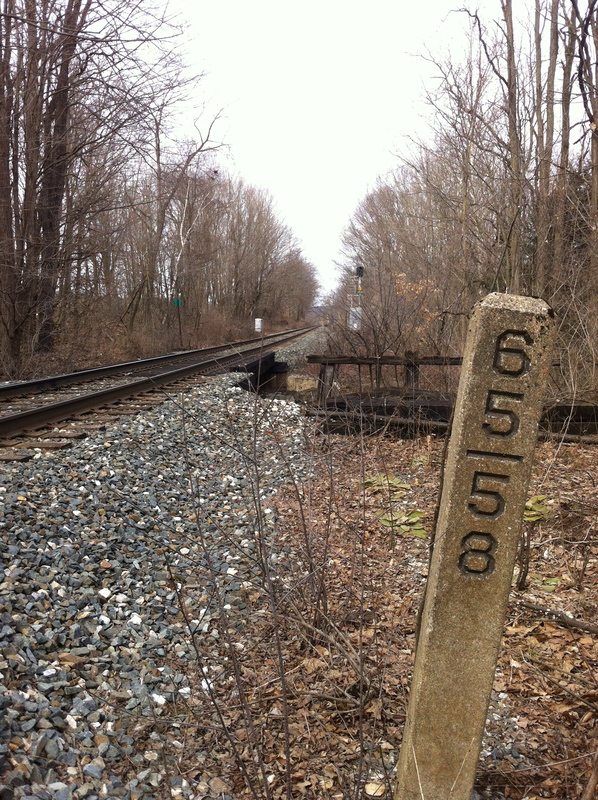 Modern mile post 130 stands alongside its retired granite counterpart (view looking north on the east side of the tracks; note Connecticut River through the underbrush). 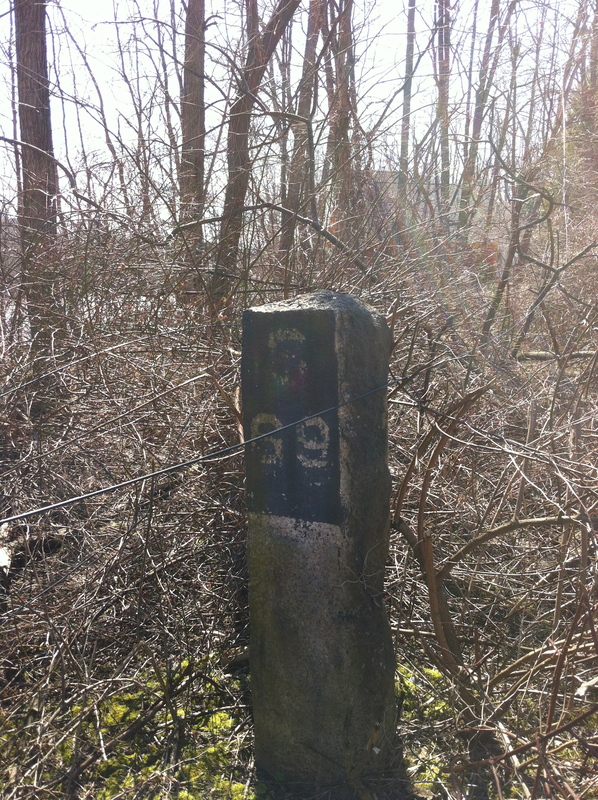 Granite mile marker (north side) with its older Connecticut River Line designation of S 69 . A sagging telegraph wire arcs past the tangles of undergrowth. Next stop north on the Vermont Valley Railroad is East Putney. What will we find there? Whatever it is, it will be another adventure in time and place in this little corner of New England’s railroad history. This chapter in the Depot Discoveries Series has a different conclusion than the previous three posts, but one shared with many a foray in search of “what had been” – and it probably will not be the last of its kind. Sometimes all that is left of a notable site is a few stones or bricks buried in weeds, or a level lot overgrown with trees, and occasionally nothing at all, completely erased by a bulldozer blade. But there may be a few clues nearby to indicate the remnants of the memory. This is one of those explorations: we’re going to East Dummerston Station alongside the Connecticut River. 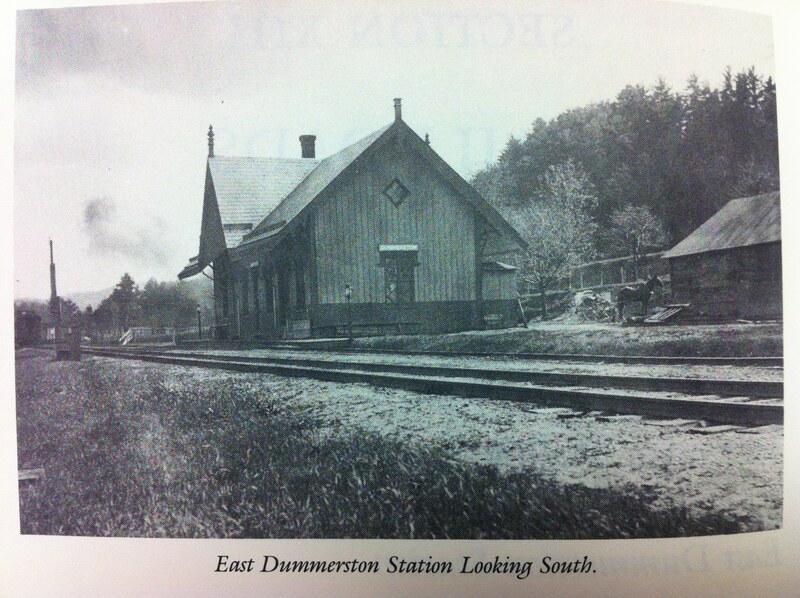 The only image found of the former East Dummerston, Vermont depot, from an excellent local history book “Dummerston: An Equivalent Lands Town 1753-1986“, published by the Dummerston Historical Society, edited by Alice Crosby Loomis and Frances Walker Manix (1990). This expedition required a bit of (mostly unrewarded) advance research. There were no historical images online and to my surprise I could find only one passing text mention on the web (another book quote) to the effect that there had been a station in this location at all, although I knew otherwise. I finally found a short informative description and a wonderful photograph in the above-mentioned book; otherwise it would have been considerably more difficult to confirm my bearings. 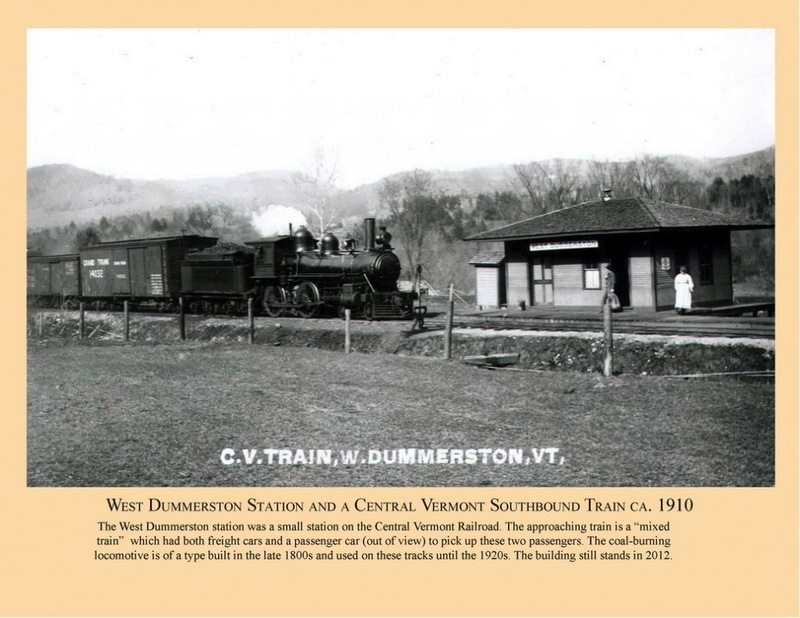 The first clue is the existence today of a certain “Dummerston Station Road”, a dead-end gravelled public thoroughfare which leads east from Vermont Route 5 toward the river and the New England Central mainline, originally the Vermont Valley Railroad. 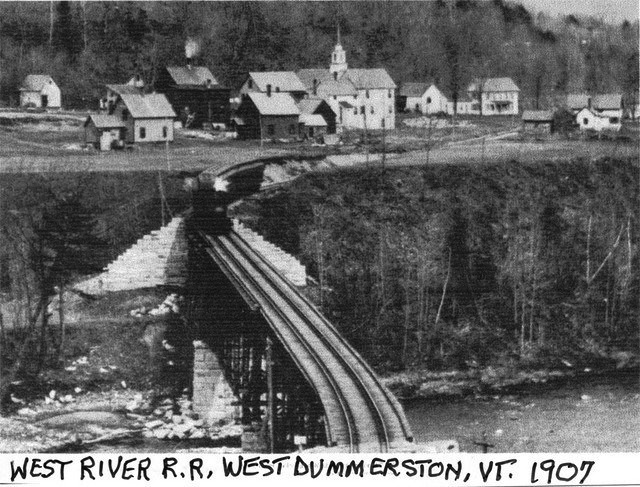 A screenshot of Dummerston Station Road, ending at the railroad and the river. The road passes by a few wooded residences, farmland, and a former grass airstrip (noted officially by Google as Moore’s Field and waggishly by the locals as Dummerston International); some nearby gravel extraction operations (we are, after all, in the mighty Connecticut’s alluvial plain, with its glacial and prehistoric Lake Hitchcock deposits lining the valley); and a number of incongruous pop-up houses stark upon the rolling fields. 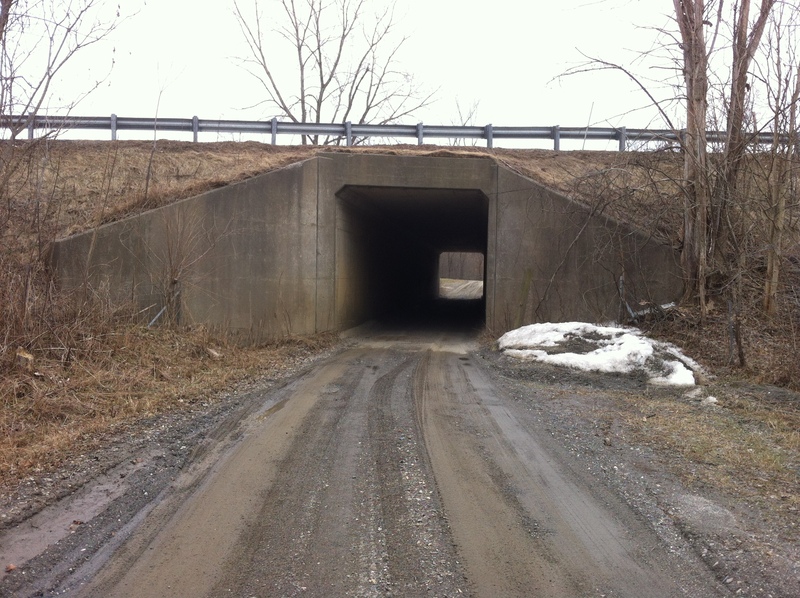 A topographic feature unknown on this stretch until it opened in 1961, U.S. Interstate 91 cuts right across the narrowing path of the road, which promptly dives beneath into a concrete box culvert, full of washed-in silt from the approaches, and pops out in a field used for seasonal truck farming. The rails and the river are just beyond, the river obscured by the raised roadbed of the railroad skirting its banks. 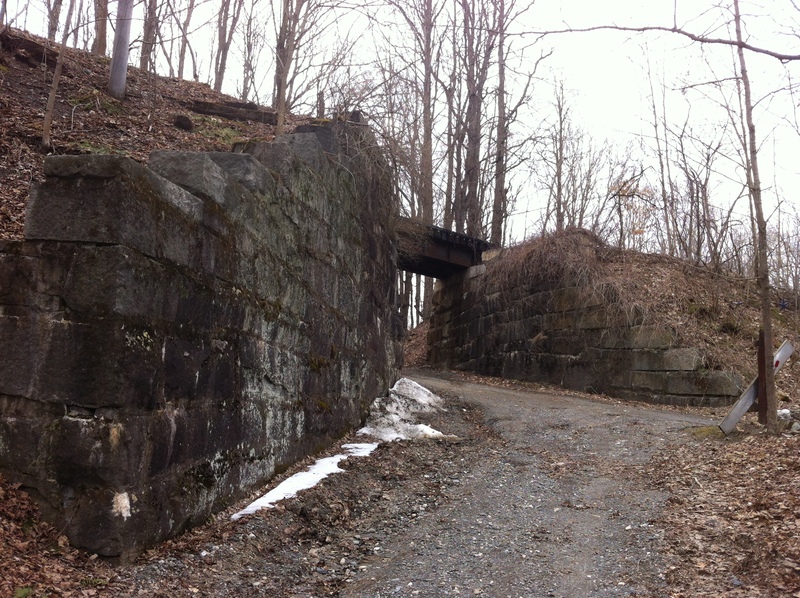 The first railroad to cut, fill, and bridge this natural right-of-way through the tumbling terrain was the Vermont Valley Railroad, chartered in 1848 (amended 1849) by the state legislature and also known as part of the Connecticut River Line. Connecting Brattleboro with Bellows Falls, construction began on a bit over 20 miles of trackage in 1850 and the road opened for operations in 1851; then the great railroad finagling of the late 1800’s began… Soon after, in 1865, Vermont Valley was leased by the Rutland and Burlington Railroad, which quickly became simply the Rutland. Then the Central Vermont stepped in, followed by the Boston and Maine, and eventually, as railroads began to decline and reorganize in the mid-to-late 1900’s, the B & M became part of Guilford Transportation Industries (now Pan Am Railways). Guilford allowed the Connecticut River Line between Brattleboro and Windsor to decline badly; Amtrak’s passenger service was forced to run the Montrealer over the dismal trackage at only 10 mph. With service suspended in 1987, the section was ordered sold and transferred back to the Central Vermont, which repaired the length connecting to its own superior tracks north and south of the gap. Amtrak’s Montrealer service was reinstated two years later in 1989 and continues to this day (as the Vermonter), with many more improvements, notably welded rail allowing high-speed passenger travel up to 80 mph. East Dummerston no longer rates as one of the stops, of course… that ended a long time ago. A few miles south, Brattleboro is the nearest passenger station but the trains do still thunder past this forgotten destination. The Central Vermont was absorbed by Railtex in 1995, which renamed it the New England Central Railroad. Railtex in turn was acquired by RailAmerica in 2000.; finally, Genesee and Wyoming Inc. agreed to buy RailAmerica in 2012. In a strange turn of history, the Genesee and Wyoming Railroad was originally a 14.5 mile shortline in western New york state with a single client; it now owns or controls 63 railroads with thousands of miles of track in six countries! The railroad continues to operate as the New England Central in this region, however, so the rest is just semantics. Eastern approach to crossing # 052746N. The East Dummerston Station’s access road turned off to the left just before this frame, placing it north of the overpass and on the west side of the tracks. 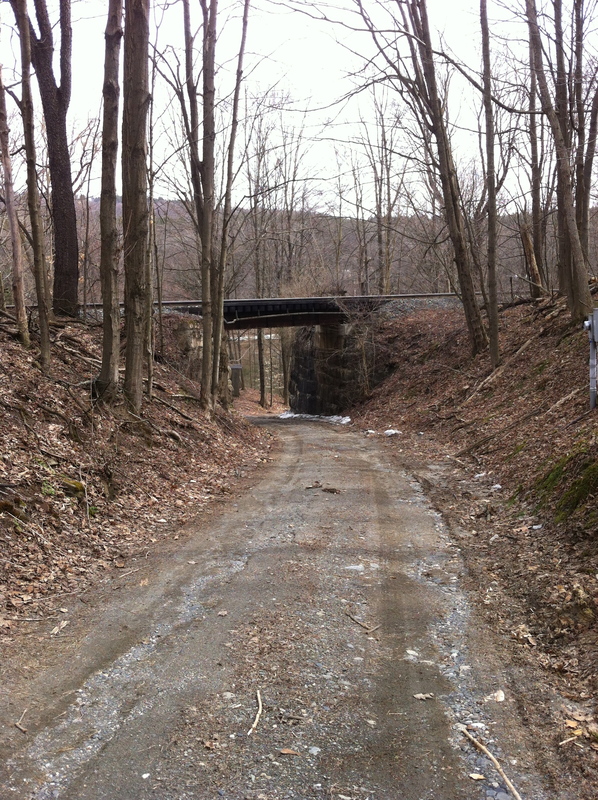 Dummerston Station Road dips down through a cut in the farmed river terrace as it approaches the right-of-way, passing through narrow quarried granite abutments wide enough for double track, as the railroad passes overhead on its existing single and westernmost line. 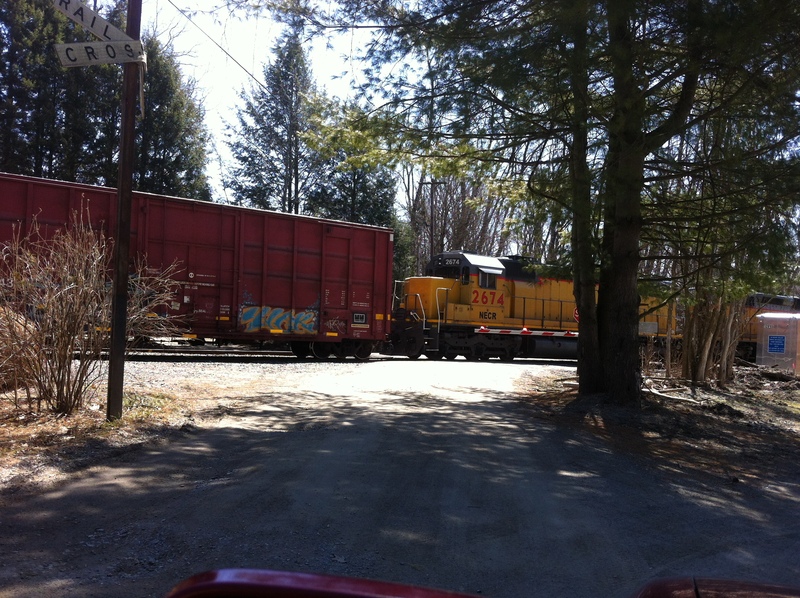 Why continue past the obstructing railroad, when the Connecticut River suddenly stops all forward progress? This was the town’s upper ferry landing, crossing to West Chesterfield, New Hampshire – its counterpart on the far shore is still very much in evidence also; long bridges were rare in those days and highly susceptible to flooding. The eastern abutments with a long southeastern wing wall, looking west from the upper ferry landing, now a turnaround and access point for fishing and a few waterside camps. The historical East Dummerston depot building, as seen in the first photo, was a rather substantial gray wooden structure with board and batten siding, done up in what appears to be a mild Carpenter Gothic Victorian style. Wooden finials and pendants, a steep cross-gabled roof with bracketed wide platform overhangs, diamond windows and hooded head casings show that this was once a place worth visiting. My sole reference book describes the station thusly: “The passenger waiting room and telegraph office, etc. 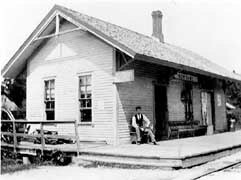 were in the central part of the building with living quarters for the station agent and his family in the southern portion and upstairs. There was a small barn [behind] at the right where the Station Agent could keep a horse and wagon for local transportation… The northern end was used as a freight and Express depot with a spur track or siding to the north for unloading carload freight such as whole corn, oats, etc…” This was a typical arrangement at small, rural whistle stops: a mainline track, a passing track (if not double track), and a back spur track for parked freight cars to be loaded and unloaded at leisure. Standing trackside barely southeastward of the overpass, on the former double track roadbed. Note the rudimentary railings guarding the abutment drop offs. The station stood “on the west side of the track a few rods north of the underpass to the river and the old upper ferry.” In the photo above, this would be at the left rear; it is completely overgrown at trackside now and I could find no trace at all of a structure – not even a pier or brick. There are many bulldozed piles of earth and rotted crossties scattered in the brambles and scrubby trees; the railroad uses the plot as an access point for signal and track maintenance nowadays – there was a rail truck parked for awhile when I visited. The block’s signal tower and control boxes are evident at center right in the photo also. 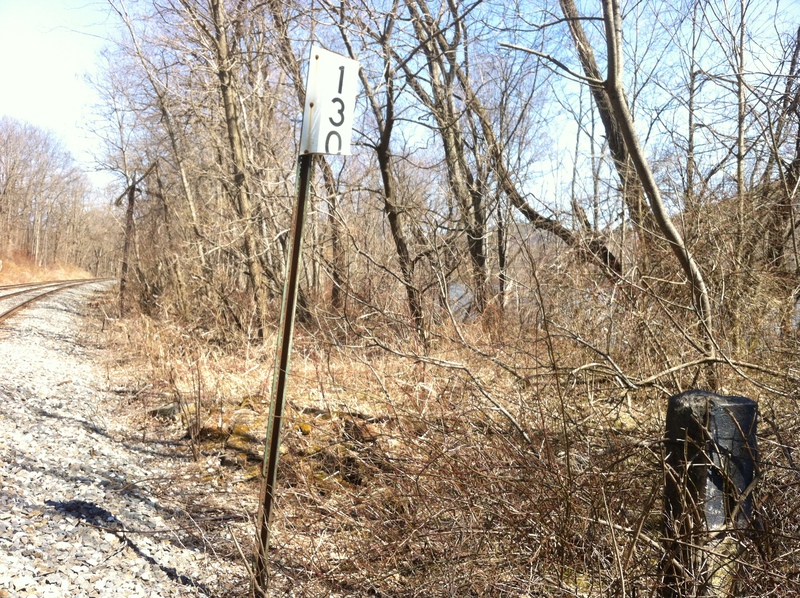 The concrete mile marker seems to be a relic of a previous incarnation’s tally system; the current mile post numbering for this spot is 012627, according to the crossing databank maintained by the Federal Railroad Administration, which still lists this as CV territory. 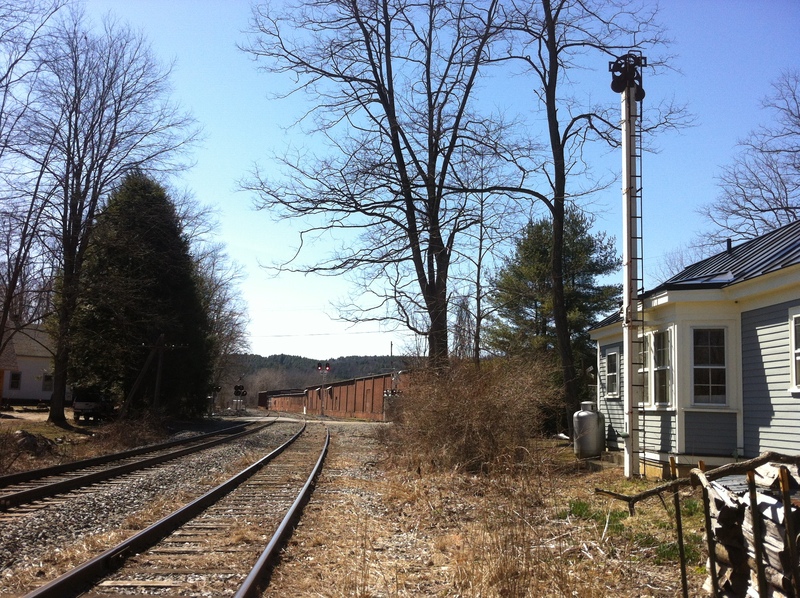 South of the station site toward Brattleboro is the beginning of the signal block, at the former location of the northbound easterly siding switch. Note the narrowing right-of-way to the left (riverside). 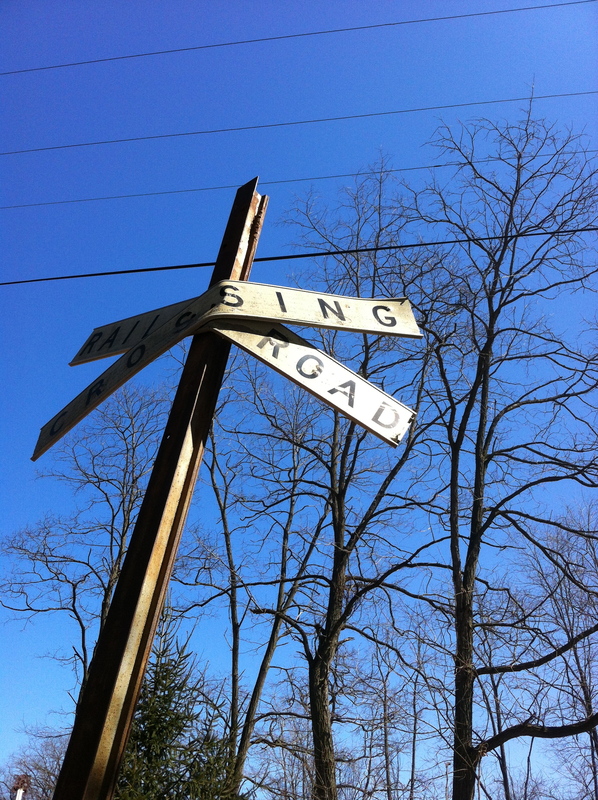 The metal milepost corresponds to the crossing’s numerical designation. Cast concrete culvert head, grated by lengths of buried rail, far into the forest. I wandered further south on the mainline and found the area, now dismantled, where a former siding’s turnout had been located and which appeared to be the start of a signal control block. The roadbed narrowed significantly at this point, with a steep drop to the river below the eastern embankment. Piles of rotted ties moldered alongside the rails and the surviving telegraph poles leaned and teetered on the eastern shoulder, a few still hoisting glass or plastic insulators and dangling wire tendrils. A very steep, flat-topped hill rose to the west, with a level shoulder between itself and the steel of varying width and sparsely overgrown, seemingly utilized for some storage or access purpose not too long ago. A narrow, dark ravine fed out of these western gravel embankments, washed out by the surface runoff of millennia. 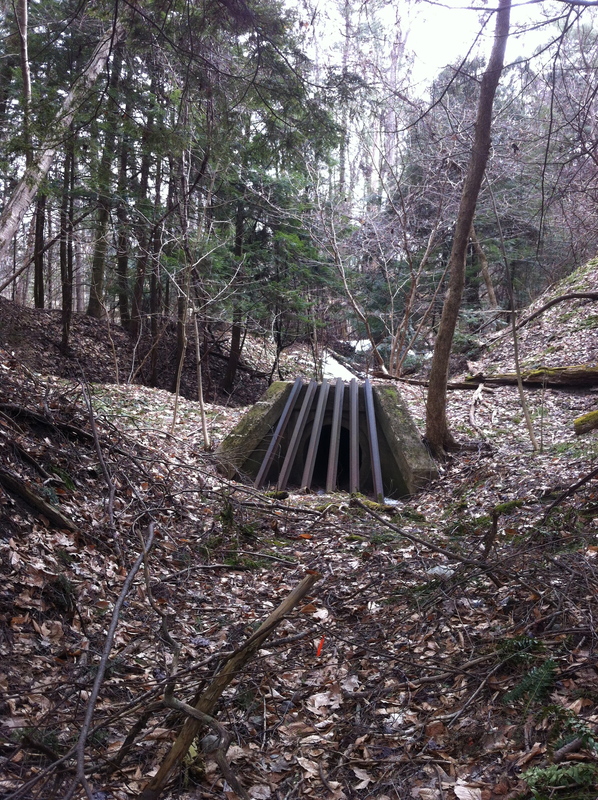 I ventured in to the understory and was surprised to find a strangely monumental culvert well into the forest, perhaps 300 feet west of the rails, installed by the railroad to prevent washouts far in advance of the water’s encroachment upon the track itself. Its outfall was deep in the original backfilled gully, east of the intervening roadbed, of course, and almost at water level. It was a fitting way to end my exploration of this ghost station site, with this odd discovery still firmly anchored in place and serving its original function. Historic photo of the Williamsville station on the West River Railroad; conspicuous is the steel truss bridge over the mouth of the Rock River, looking northbound. The West River is just out of the frame to the right, paralleling the tracks. 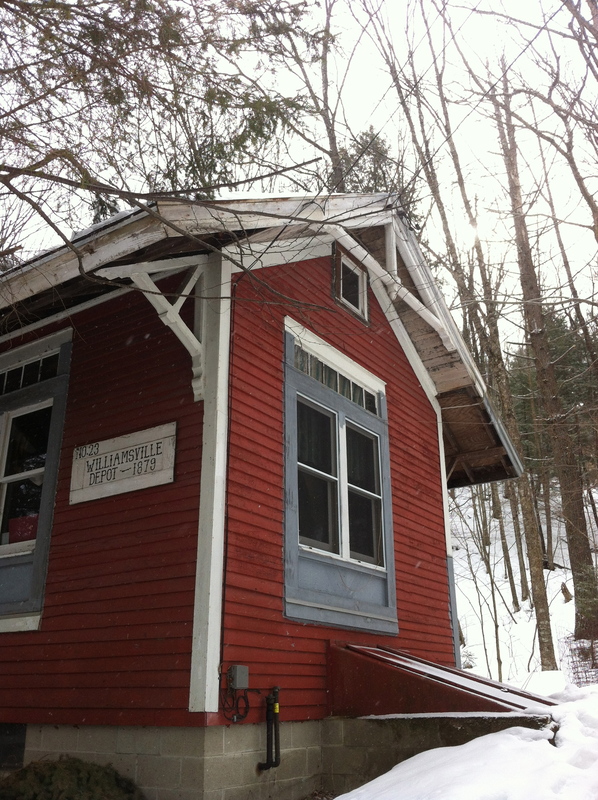 After departing Brattleboro, the second stop heading north on the West River Railroad (after passing through West Dummerston village) was the Williamsville Depot. Another modest but serviceable frame structure in a simple Victorian style akin to the other station buildings along the line, it stood on the west edge of the tracks sandwiched between the rails and the road to Newfane. The West River itself coursed along close by to the east, a constant companion to the 36 miles of twisting, narrow roadbed. Williamsville is a village in the town of Newfane, Vermont – the seat (shire town, in the New England vernacular) of Windham County in the southeastern corner of the state. The actual village center is over 2 miles away, but railroad service was a coveted commodity in the late 19th century and the residents of Williamsville were going to have their own stop, if they had any say in the matter: the town of Newfane bonded $25,000 as a pledge of support. 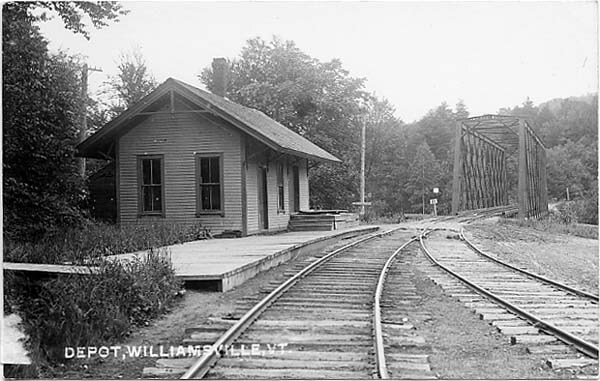 The road between the hamlet and its little railroad station was dubbed Depot Road; it has recently been renamed Williamsville Road. Interestingly, the Williamsville depot lies (just barely!) over the town of Newfane’s eastern boundary line, which passes through the mouth of the Rock River and places it within the town of Dummerston. The former roadbed of the West River Railroad and the site of the Williamsville station is now parking for a popular swimming hole at the confluence of the West and Rock Rivers. Both the railroad and the adjoining valley road crossed the Rock River, known as the Marlboro Branch in those days, immediately north of this point on separate bridges; the road originally on a covered bridge just west of the railroad’s own timber trestle span. The bridges changed appearances regularly, a result of Vermont’s knack for spring freshets – eventually the wooden bridges were replaced with steel versions, which continued to be challenged by the floodwaters and swept downriver periodically. Upon its closure in 1936, the railroad’s last steel truss was considered as a replacement for the road’s bridge, with a slight realignment of the highway necessitated, but both the plan and the span were scrapped soon thereafter, and a new structure put in place for automobile traffic. 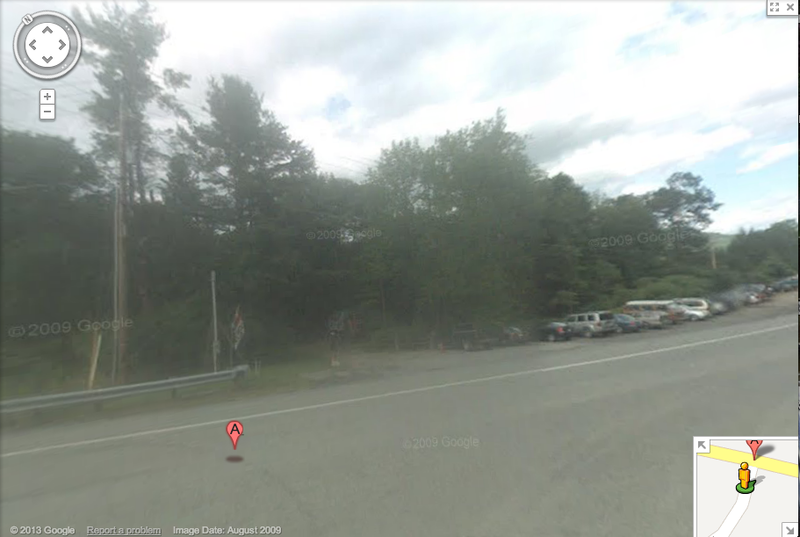 The area is a very popular swimming hole nowadays; the former trackside and both shoulders of Vermont Route 30 are often lined bumper-to-bumper with cars, many bearing license plates other than Vermont’s own green tags, on hot summer days. 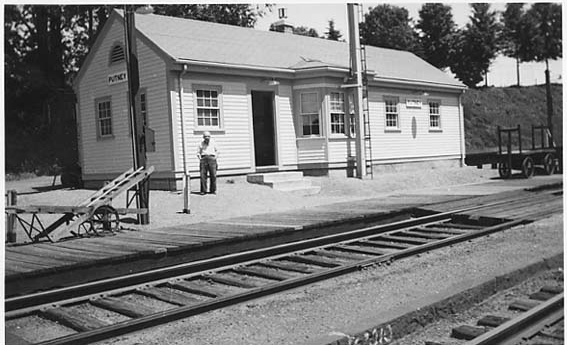 The depot structure now serves as a residence a short distance away from its original site. 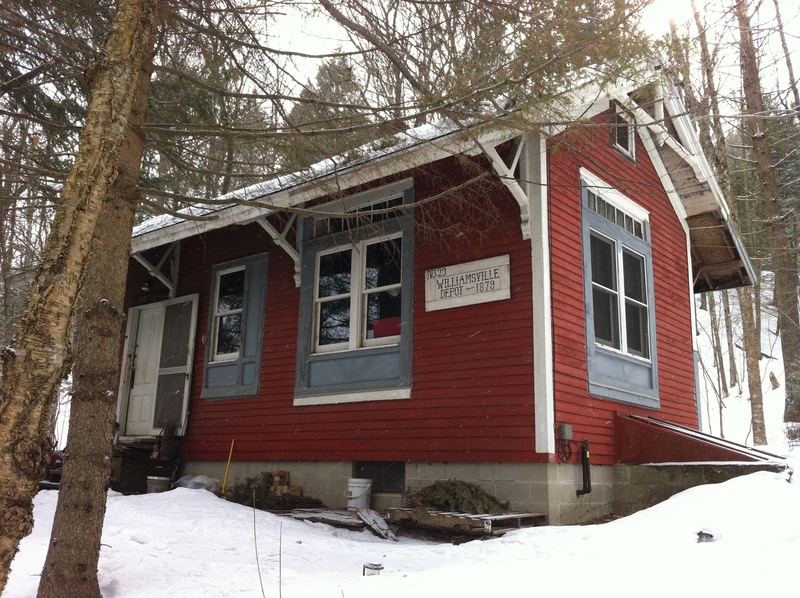 The original stops on the West River Railroad were built by a Brattleboro contractor named Patrick Fleming; as mentioned, they were all of a similar architectural style, a simple New England Victorian. 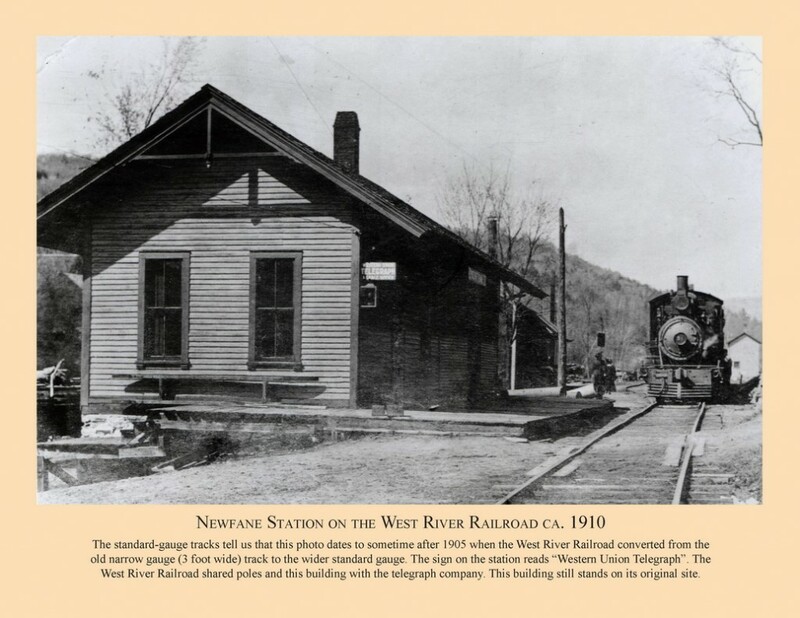 A nice summation which basically applies to all of the station structures on the line can be found in a historical survey of the village of Newfane itself, citing the somewhat larger depot there (page 11). An excerpt: “… the modest one-story, wood-framed and clapboarded building extends three bays along its trackside (east) eaves facade, its gable roof sheathed with asphalt shingles. Chamfered stickwork decorates the gables of the two-bay north and south elevations; similar outriggers support the deeply overhanging eaves of the east and west elevations. The two-over-two sash have bracketed sills. Transomed sliding doors on the east and north elevations distinguish the former baggage/freight room in the north half of the building…” The orientation and layout of the Williamsville station was identical to this description but on a smaller scale, the result of its importance relative to the others. A closeup of the north elevation shows the chamfered gable stickwork and eave brackets. The doors and window millwork have all been replaced on the current residential structure, but the resized openings are still very evident. 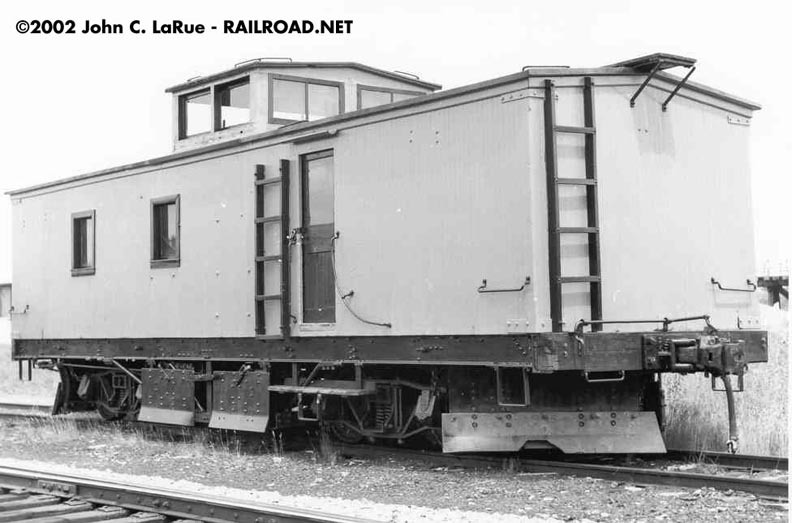 The sliding freight doors were positioned higher than the passenger’s walk-in entrance since they were on a raised wraparound platform for ease of loading and unloading baggage and shipped goods, readily seen in the historic photograph and obvious in the renovated state of affairs.